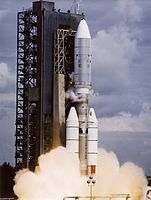 The Titan IIIE or Titan 3E, also known as the Titan III-Centaur, was an American expendable launch system. Launched seven times between 1974 and 1977, it enabled several high-profile NASA missions, including the Voyager and Viking planetary probes and the joint West Germany-U.S. Helios spacecraft. All seven launches were conducted from Cape Canaveral Air Force Station Launch Complex 41 in Cape Canaveral, Florida. In the early 1960s, NASA’s long-range plan was to continue using Atlas-Centaur until a reusable launch system or a nuclear-powered upper stage could be developed. To help fund the escalating Vietnam War and the new War on Poverty, Congress drastically reduced the funding of the civilian space program. In addition, further development of the reusable launch vehicle was postponed. NASA needed a launch vehicle more powerful than Atlas-Centaur to send heavier planetary probes like Viking and Voyager into space in the 1970s. So, NASA began in 1967 to consider the possibility of mating a Centaur upper stage with the Titan III. :140 On June 26, NASA contracted with Martin Marietta to study its feasibility. By March 1969, this combination looked promising. NASA assigned management of the vehicle to the NASA Lewis Research Center (now known as the NASA John H. Glenn Research Center at Lewis Field) with follow-on contracts with Martin Marietta to develop what became the Titan IIIE and General Dynamics to adapt the Centaur D-1. Several modifications to the Centaur were necessary to accommodate the more powerful booster. The most obvious change was enclosing Centaur in a large shroud to protect the stage and payload during ascent. The shroud made it possible to improve Centaur's insulation and thereby increase its coast time in orbit from thirty minutes when launched on an Atlas-Centaur to over five hours on the Titan IIIE. Because Centaur was wider than the Titan's core stage, a tapering interface was required. This interface needed insulation to prevent Titan's ambient-temperature hypergolic propellants from causing the boil-off of Centaur's cryogenic fuels. The Centaur stage also contained the guidance computer for the entire launch vehicle. A four-stage configuration was available, with a Star-37E being the additional upper stage. This was used for the two Helios launches. Star-37E stages were also used on the two Voyager launches, but the stages were considered part of the payload instead of part of the rocket. The first launch of the Titan IIIE on February 11, 1974, was a failure. As a "Proof Flight", it was planned to have the same trajectory as the Viking mission to Mars that was scheduled for launch in 1975. The original plan was for this flight to carry the Viking Dynamic Simulator (VDS), a model of the Viking spacecraft. Engineers at the Lewis Research Center, however, ultimately persuaded their colleagues to put the Sphinx satellite on the flight instead of the VDS. The mission of the satellite was to measure the interaction of space plasmas with the satellite's high-voltage surfaces. The Titan performed normally during launch, but the Centaur's engines failed to start. :145 After waiting for a minute, ground controllers issued an unsuccessful manual start command. With the Centaur in free-fall, a safety destruct command was issued at 748 seconds after liftoff:145 by the radar station in Antigua. The next flight of the Titan IIIE was on December 10, 1974, carrying the Helios-A spacecraft. This mission was successful, as were all subsequent launches. 13:48:02 23E-1 TC-1 Sphinx Failure Centaur liquid oxygen turbopump malfunction. RSO destruct at T+742 seconds. 07:11:02 23E-2 TC-2 Helios-A Success First space probe to orbit closer to the Sun than Mercury. 21:22:00 23E-4 TC-4 Viking 1 Success Carried a lander that landed on Mars. 18:39:00 23E-3 TC-3 Viking 2 Success Carried a lander that landed on Mars. 05:34:00 23E-5 TC-5 Helios-B Success Once held the record for a space probe's fastest velocity relative to the Sun. Now held by Parker Solar Probe. 14:29:44 23E-7 TC-7 Voyager 2 Success Additionally boosted by a Star 37E upper stage. Flew by Jupiter, Saturn, Uranus, and Neptune, thereby completing the Grand Tour program. Now leaving the Solar System. 12:56:01 23E-6 TC-6 Voyager 1 Success Additionally boosted by a Star 37E upper stage. Flew by Jupiter and Saturn. Exited the Solar System's heliosphere in 2012. The most distant human-made object from Earth. ^ a b c d e f g h i j k l m n Dawson, Virginia; Bowles, Mark (2004). Taming Liquid Hydrogen: The Centaur Upper Stage Rocket 1958-2002 (PDF). National Aeronautics and Space Administration. ^ a b c d e f g h i j k l m Convair Aerospace Division of General Dynamics; Martin Marietta Aerospace (September 1973). "TITAN IIIE/CENTAUR D-IT SYSTEMS SUMMARY" (PDF). National Aeronautics and Space Administration. Retrieved June 5, 2018. ^ Krebs, Gunter (February 14, 2011). "Star-37". Gunter's Space Page. Retrieved June 6, 2018. ^ Wade, Mark. "Titan". Encyclopedia Astronautica. Retrieved January 25, 2009. ^ J. D. Hunley (2013). The Development of Propulsion Technology for U.S. Space-Launch Vehicles, 1926-1991. Texas A&M University Press. p. 89. ISBN 9781603449878. Retrieved June 6, 2018. ^ Krebs, Gunter. "Titan-3E Centaur-D1T Star-37E". Gunter's Space Page. Retrieved January 25, 2009. ^ Krebs, Gunter. "Titan-3E Centaur-D1T". Gunter's Space Page. Retrieved January 25, 2009.